The Face on Mars refers to a photo of a feature that looks like a human face on the surface of the planet Mars, specifically in the area of Cydonia Mensae, an area of Mars adjacent to the border between the Northern lowlands and the Western Arabia Terra. The mensae are characterized by knobs and mesas (mensae is the plural of mensa, which means table). It was first discovered by the Viking 1 orbiter. Project scientist Harold Masursky joked about it that "This is the guy that built all of Lowell’s canals." NASA released the photo to the public and pointed out this cool trick of light, shadows, and low-resolution orbital photography. However, true believers know that the feature was actually built by aliens and that NASA has been trying to cover that up (NASA's mission to search for evidence of extraterrestrial life or civilizations is actually a lie orchestrated by Reptoids). One of the most persistent supporters of this delusion is Richard C. Hoagland. Hoagland won the 1997 Ig Nobel Prize in Astronomy for his book The Monuments of Mars: A City on the Edge of Forever. In the years since the first image, high resolution photographs with shadows falling in other directions have shown the idea of a "face" to be false. Over 40 years, resolution of the imagery has steadily improved from 44.7 m/px to 0.25 m/px. Besides the fact that proponents of the idea have no evidence of an intelligent designer, they also make an error that many anti-evolutionists make. Seeing a series of coincidences in a single area, they understand that the probability that these were created naturally is small. From there, they assume that as the probability was small, it must have had a designer, ignoring the fact that the post-probability is exactly 1, as that is the way it naturally turned out. It is just as likely that the 'face' could have ended up two feet north of its current position. It is just as likely that all of these shapes could have ended up in a different area of Mars. It is less likely that Mars could have ended up covered in faces. However, none of these happened, as the only current situation happened. This is similar to the monkey typewriter theory. The human brain is surprisingly active when the eyes that belong to that brain see a face, practically screaming to the mind of the individual of which that brain belongs "Dude! That's a face!" Unless suffering from prosopagnosia, a person can not help but to see a face when viewing any shapes arranged to even remotely form a face. This is known as pareidolia. There would probably be fewer claims of a conspiracy or intelligent intent were a hill to form the shape of an elbow, a foot, or even a fairly distinctive hand giving the Earth a middle finger (*cough* Carina Nebula *cough*). NASA's Mars Global Surveyor imaged the "Face" in April 1998, before it had even finished aerobraking into low Martian orbit. Due to the interest in the "face" NASA released the new photos which clearly showed it to be a mountain, although it does look a bit like an island surrounded by no water. This confirmed NASA's initial position that it was due to the light and the low-quality resolution of the camera on the Viking 1 that gave it the smooth appearance. The orbiter photographed the face again in 2001, when it was in its proper mapping orbit, allowing higher resolution images. Naturally, all the "Face" enthusiasts accepted that they were wrong and showed no further interest. Ha, you knew better than that, didn't you? In 2007, the HiRISE camera on board the Mars Reconnaissance Orbiter took another image with the monster resolution of 25 cm/pixel. The "Face" still looked like a weathered mesa (hill). In July 2014, a book by Mike Bara was published, still insisting that the "Face" has specific features that can only be artificial. Bara cited "two aligned eye sockets, the tip of the nose is the tallest point on the structure, there are two clearly defined nostrils in the nose, the west eye socket is shaped like a human eye including a tear duct, there is a spherical pupil in the eye…" He showed the 2006 Mars Express image, whose resolution is 13.7 m/px, but reduced the far better (0.25 m/px) HiRISE image from 2007 to a pitifully small, shadowed thumbnail and denigrated it in the text. When properly reproduced, the image conclusively shows that those detail features are absent. The physicist John Brandenburg thinks that Cydonia was one of two places on Mars that was wiped out in a thermonuclear war. He has published two science posters and a book, Death on Mars: The Discovery of a Planetary Nuclear Massacre. 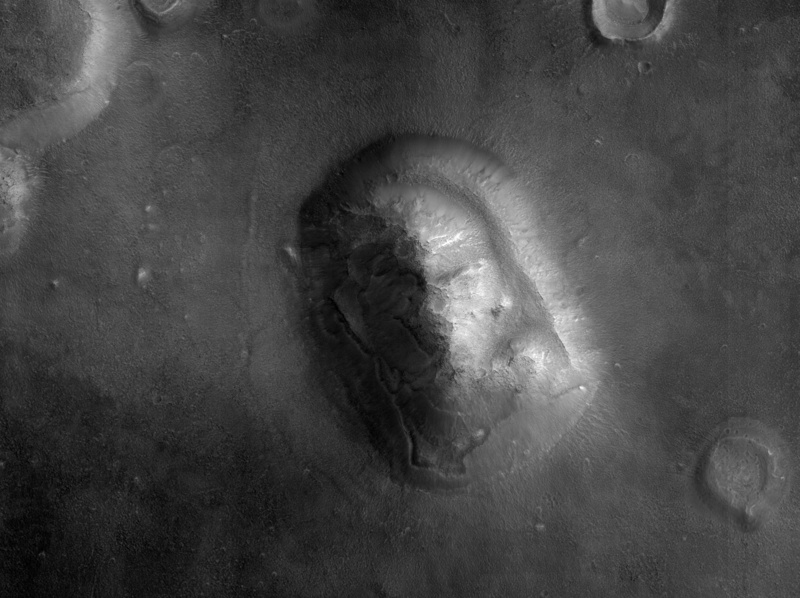 The face found in Cydonia isn't alone on Mars. The impact crater Galle is also known as the "Happy Face" crater because of its uncanny resemblance to, of course, a happy face. It's not difficult to see how this could come about. Craters are, generally, circular, and any two dots caused by additional craters or mountains can easily be mistaken for eyes (craters within craters are common on old surfaces that haven't been reworked through tectonics and erosion, and is usual for very large craters to have an inner ring of mountains, more or less complete[note 1]). With the addition of something vaguely shaped like a mouth, the odds of a crater existing that could be interpreted as a face approach certainty. The Happy Face crater also appears in Watchmen; the happy face is a recurring visual motif of the film and comic book. Following the launch of Google Earth, people have now begun finding faces on Earth as well, such as this mountain in Canada. An early sighting of Jesus in Peru seems to have since vanished. ↑ Bara, Mike (2014). Ancient Aliens on Mars II. Kempton, IL: Adventures Unlimited. pp. 294. ISBN 978-1939149-31-2. This page was last modified on 6 March 2019, at 21:17.